Added The Way Back. A great look into the Soviet Gulag system and the effort necessary to escape! Added K Blows Top to our list of book recommendations. As you know, we are a student of history and here is a list of the best books we've found on the study of communism. This new book is a fun and easy read about Nikita and Nina Khrushchev's 1959 visit to the states. You'll learn to never invite a commie to dinner! Added Paul Garmirian to our Humidor list. Called "the President's cigar", this cigar has been the choice of recent US presidents. We added the DC Trawler, Diogenes' Middle Finger, Anti-Anti Underground, Maser Media, Hope n' Change, Merry Poppet, Maksim, and Sad Hill blogs to our Comrades list. This is a list of bloggers who we've met, who are Facebook Friends, or who we have communicated with. 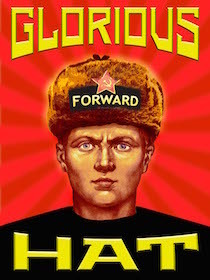 Some have helped us promote our Commie Obama hats, and as you can see, some are hat owners too! Smart guys and gals. Be sure to visit each one! To our Other Good Blogs, we added photoshop blogs The Looking Spoon and Big Hairy News, and gun blogs Sharp as a Marble and Oleg Volk. We removed Weasel Zippers from this list. They never would write back to us, and we agreed with BigFurHat's frustrations. In the Others section, we added English Russia, a great blog with photos from Russia including many historical albums. And we added a link to Liberty in North Korea's (LiNK) blog page. They do God's work in helping North Koreans escape to South Korea. Donate if you can! Thanks to all the comrades who visit Ushanka!